Though the quintessential New England house is usually considered a white clapboard farmhouse or Cape, we actually have quite a few mid-century modern homes. And we have even more of their successors, the ubiquitous ranch house. Mid-century modern houses typically have big windows, open floor plans, integration with the outdoors and little ornamentation. Frank Lloyd Wright was an early practitioner of mid-century modern homes, though he called it ‘Prairie Style’ or ‘Usonian.’ Refugees from Hitler’s Germany such as Walter Gropius and Ludwig Mies van der Rohe brought their own modernist philosophy – known as Bauhaus -- to America. They influenced a generation of architects who designed mid-century modern structures from about 1945-75. Then mid-century modern fell into disfavor. In 1975, critic Tom Wolfe excoriated mid-century modern style as architecture that nobody liked in his book, From Bauhaus to Our House. Today, however, mid-century modern homes are popular again and command high prices. In New Canaan, Conn., a 1,500-square-foot house designed by Philip Johnson sold for $2.3 million in 2015. Here, then, are six mid-century modern homes, one (at least) in each New England state. If you know of others, please share them in the comments section. The famous Glass House was built in one of Connecticut's wealthiest towns. Philip Johnson designed the Glass House in 1949 as a weekend retreat in New Canaan, an upscale suburb of New York. Johnson belonged to a group of modern architects known as the Harvard Five, who lived and worked in the town. They all followed Walter Gropius. The Glass House is an extreme version of a mid-century modernist home. Johnson designed the kitchen, dining and sleeping areas as one glass room. He enclosed the bathroom in a brick cylinder, the only object to reach floor to ceiling. Eventually he only used it for entertaining and stayed in another building on the property – a brick guest house. 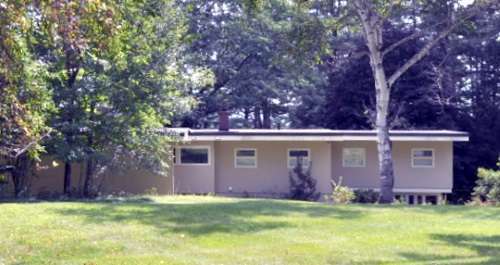 New Canaan has about 80 other mid-century modern homes built between 1940 and 1960. Not everyone loved them, and tore down about 20. The town now tries to preserve them. You can visit the Glass House in the summer (for information, click here). You can see many of the rest of New Canaan’s mid-century modern homes in the 1997 film The Ice Storm. 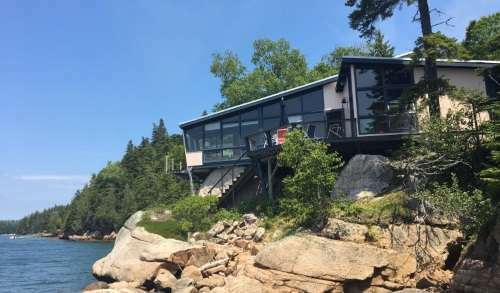 Deer Isle, a fishing community in Penobscot Bay, has a collection of 48 mid-century modern homes designed by Emily Muir. The Boat House is one of them. Emily, born in 1904, was an artist who married sculptor William Muir. As a child she summered on Deer Isle and moved there permanently in 1939 with her husband. She didn’t turn to architecture until she reached her own mid-century. Emily had no training in architecture and designed her first home for her mother. That got her hooked on architecture. Her homes have exaggerated angles and large windows that let in plenty of light. Many, like the Boat House, are perched on boulders that overlook the water.She tried to use as much local granite and wood as possible. People who live in them now say they love the views, but Emily didn’t cook and didn’t clean so the kitchens often need renovation and the closet space is limited. She designed the houses to be affordable so fishermen could buy them, but it was summer people who snapped them up. Emily Muir died in 2003 at the age of 99. You can rent the Emily Muir Boat House from the Island Agency (click here). Even If you don’t’ love mid-century modern homes, you’ll probably love the views. 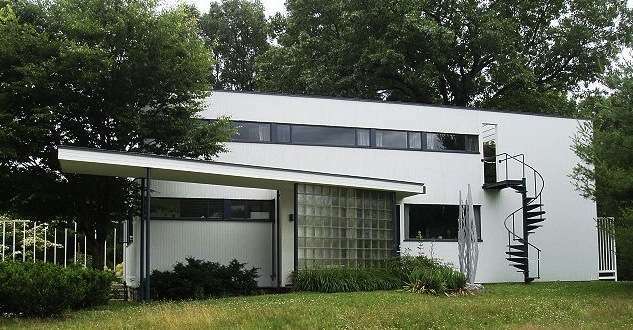 The Gropius House stands as a symbol of modern architecture in Lincoln, Mass. But in 1937, Lincoln itself symbolized freedom to Walter Gropius, who settled in the historic town while teaching at Harvard. .
A Lincoln philanthropist, Helen Osborne Storrow, gave Gropius the land on which to build a house. Gropius built a simple, efficient contemporary home that melded industrial and traditional New England architectural materials. He used a fieldstone foundation, white painted wood, a brick chimney and a screened-in porch. Many of the fixtures were ordered from catalogs. It cost $18,000. He later said he wanted to take a contemporary approach to traditional New England architecture. When finished, the Gropius House created a sensation. Composer Igor Stravinsky, lecturing at Harvard, was so anxious to see it that he and his new bride visited it scarcely an hour after their wedding in March 1940. Mrs. Storrow was so pleased with it she allowed other architects to build mid-century modern homes on her land. For information about visiting the Gropius House, click here. Frank Lloyd Wright was designing mid-century modern houses well before mid-century, but he designed the Zimmerman House in Manchester, N.H., smack in the middle of the 20th century. In 1950. Wright designed the house, the interiors, the furniture, the gardens and even the mailbox for Isadore J. and Lucille Zimmerman. The Zimmerman House is one of the few Prairie Style houses in the Northeast. They are typically small, single-story dwellings without a garage or much storage. 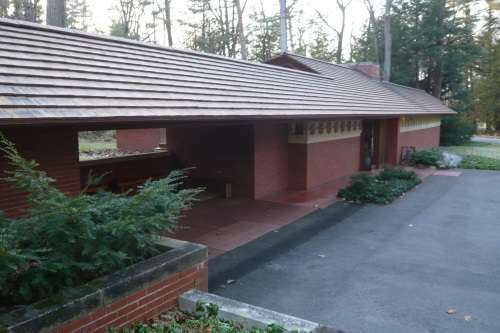 The Zimmerman House has a carport – a mid-century modern concept and a word Wright came up with. Like many Wright houses, the Zimmerman House has an L-shape, and it fits around a natural feature – a large rock near the front door. For information about tours of the Zimmerman House, click here. Ira Ratansky designed this mid-century modern structure as a synagogue. It is now the Rhode Island Hindu Temple. Ira Rakatansky was Rhode Island’s most renowned modernist architect. The son of Russian immigrants, he graduated from the Rhode Island School of Design in 1942 and then studied architecture under Walter Gropius at Harvard. He set up his architecture practice back home in Providence, where he worked from 1947 to 1992. Rakatansky designed dozens of mid-century modernist homes, temples, offices, bowling alleys and drive-ins, mostly in New England. He designed his own house on Everett Avenue in Providence. It features soaring ceilings, large windows that bring in the outdoors and open interior space. Rakatansky died in 2014. You can take a youtube tour of Ira Rakatansky houses here. 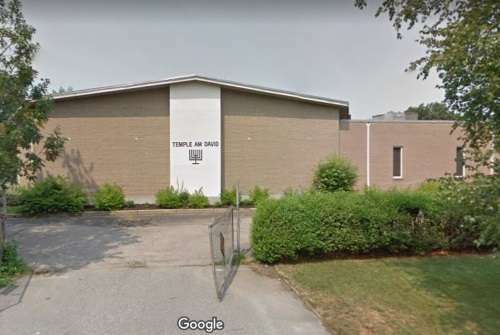 We couldn’t find any Ira Rakatansky homes open to the public, but we did find a temple he designed, then known as Beth Am in Warwick, which became Am David. A mid-century modern home in Norwich, Vt.
You may not think of Vermont as a hot spot of mid-century modern homes, but Norwich has an entire collection of them. Located on Hopson, Pine Tree and Spring Pond Roads, the National Register of Historic Places listed the district in 1991. The town lies across the Connecticut River from Dartmouth College. The college attracted academics open to mid-century modern design. Norwich’s role in mid-century modern style may have started when another German architect, Walter Curt Behrendt, escaped Nazi Germany and came to the Upper Valley, according to the Valley News. Dartmouth made him artist in residence, and he built his own home in Norwich in 1945. Edgar Hayes Hunter and Margaret King Hunter, students of Gropius, taught at Dartmouth and designed several mid-century modern homes in the area. And Keith and Edna Warner get credit for starting the mid-century modern trend in 1951, when they bought a large piece of land and built a house on it. They sold off parcels to similarly minded people, many of whom had their home designed by Charles McKirahan of Fort Lauderdale. Typically they are set back from the roads, with a horizontal orientation, flat roofs and large glass windows looking out on the hills. The Norwich Historical Society has an online exhibit called Mad for Mid-Century Modern. You can see it here. Images: Glass House By Staib - Own work, CC BY-SA 3.0, https://commons.wikimedia.org/w/index.php?curid=7797606; Zimmerman House By Jane023 - Own work, CC BY-SA 3.0, https://commons.wikimedia.org/w/index.php?curid=21316008; Norwich, Vt. Home By Magicpiano - Own work, CC BY-SA 4.0, https://commons.wikimedia.org/w/index.php?curid=72230045; Emily Muir Boat House courtesy The Island Agency. Thanks for including our online exhibit. Please note that Norwich University is located in Northfield, Vermont. Norwich University left Norwich, Vermont in 1866.